Germany has confirmed their 2018 FIFA World Cup squad with Joachim Löw pulling off a few surprises along the way. PFA young player of the year, Leroy Sane has been left out of the squad alongside goalkeeper Leno. Below is the confirmed 23-man world cup squad. 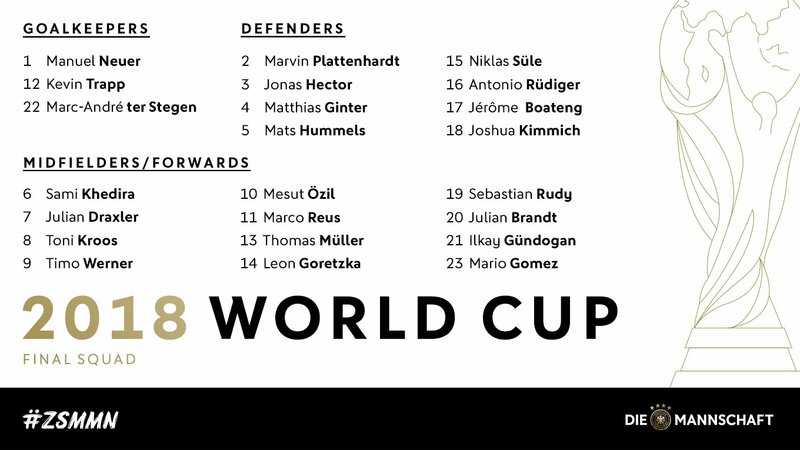 Confirmed Germany 23 Men Squad: Jochim Low has announced the squad for 2018 FIFA World Cup and its a very strong one with one notable absentee in Leroy Sane. Germany qualified for the world cup 2018 under the coaching of (Joachim Löw). The 2014 world champions are hopeful to repeat the history once again. In the final Germany defeated Argentina to become the champion in the golden time period. So far there is no announcement made about the players selection for the upcoming world cup in Russia. The team is lead by the skipper (Manuel Neuer) goalkeeper of the team. Some new youngsters that were adjusted in the squad by the coach to bring the freshness. Julian Brandt, Timo Werner, Niklas Süle and Leroy Sané are the youngsters to watch for team during the world cup. Leroy Sane performance with Manchester City made his position prominent for the squad of world cup 2018. Timo Werner will be surprised entry for the Germans in world cup who score 7 goals in 10 matches for RB Leipzig. On 17th June Germany will start their world cup 2018 campaign.They play match against (South Korea, Sweden, Mexico). As compared to the other groups of World cup Germany got tough opponents.